A beautiful mountain range on my way to Bainbridge Island yesterday. I love the mountain. It’s a hint of spring in a city that doesn’t know the season. It’s the promise of summer after too many long months of rain. It’s a reminder that everything is going according to plan. Not your plan. The mountain’s plan. The mountain is Mount Rainier, but it’s also every other mountain you can see from your vantage point. The mountain is also, annoyingly, a metaphor. 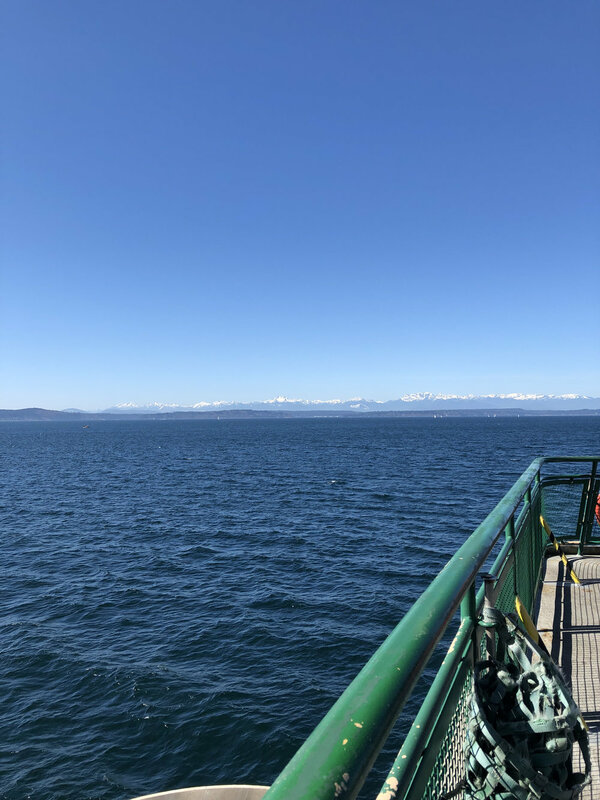 Yesterday, the mountain was a ferry ride to Bainbridge Island, cold and windy and, as always, wholly unprepared for the cost of this roundtrip paradise. It was the anticipation of an all female cast, a run in with an artistic director I haven’t seen in almost a year, the satisfaction of volunteer ushering for a friend’s show. Today, the mountain was prosperity: a freelance check I had to pick up, a donation from an unexpected source, and a casting revelation unlocked. Tomorrow, the mountain will be cooking dinner with a friend and introducing her to both the joy and the horror of the film West Side Story. Hopefully, the mountain will also be ten pages of writing — writing I didn’t do today because the mountain was too distracting. And then by the end of the week, the mountain will disappear again. I’m on an apology tour of Seattle, explaining how depressed I was when I first moved here, promising I love it now — flaws and all. I feel weird every time I say it. I’m sorry, I love you. I’m sorry, I’m here now. My first play about Seattle is mired in anxiety, an anxiety I still live with every day. But it’s a low hum now, not a scream. And one day — maybe one day soon — I’ll write my love letter to this weird little city. But for now, we have the mountain. And the mountain is out.